The Mid-Ohio Regional Planning Commission (MORPC) is launching a Rapid-Speed Transportation Initiative (RSTI) to explore intercity routes that could utilize two rapid-speed transportation technology options – traditional passenger rail and/or Hyperloop technology — between Chicago, Columbus, and Pittsburgh. MORPC will conduct two studies as part of this initiative: a feasibility study of Hyperloop technology for the corridor, followed by components of an environmental study of the corridor. For these two studies and later phases, MORPC anticipates the total cost of the RSTI to reach approximately $2.5 million. 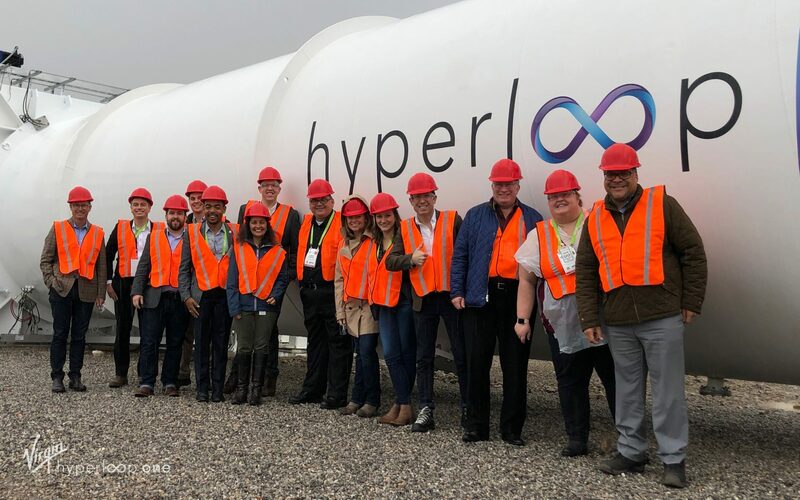 Columbus leaders recently visited DevLoop, the world’s only full-scale Hyperloop test track. Multiple partners have verbally committed financial resources to the initiative including the city of Columbus ($250,000), Ohio and Indiana rail partners including MORPC, Union County, and the cities of Marysville and Lima ($500,000). Additionally, support from other private partners and Virgin Hyperloop One is anticipated but yet to be determined. Midwest Connect, spearheaded by MORPC and other regional partners, was one of 10 global winners of the Virgin Hyperloop One Global Challenge. The advanced route analysis, paramount in winning the challenge, included the only route selected in the United States to cross four states; Pennsylvania, Ohio, Indiana and Illinois. It is also the first in the U.S. to focus on leveraging major freight assets in the Midwest, the epicenter of freight movement in North America. Virgin Hyperloop One, sponsors of the global challenge, is the only company in the world to have a fully operational Hyperloop system. In the first phase of this initiative, MORPC is issuing a RFP for a Feasibility Study for potential routes supporting the Midwest Connect Hyperloop project connecting Columbus to Pittsburgh and Chicago. The Feasibility Study, estimated to take nine months, will include two potential route alignments for evaluation. One option follows the rail corridor featured in the Hyperloop One Global Challenge Midwest Connect corridor proposal; the other is an alternative to be defined as part of the study work. At minimum, the potential routes will include the following cities: Chicago, Fort Wayne, Lima, Marysville, Columbus and Pittsburgh. The Midwest Connect Hyperloop One Corridor Feasibility Study will enhance work already completed by MORPC that submitted the winning proposal to Virgin Hyperloop One as part of its “Global Challenge” competition last year. The Feasibility Study will further define and identify the optimal range of initial implementation and alignment and initial stations and end-points. It also will provide estimates of transportation demand and economic benefits, develop a business case, implementation strategy and stakeholder and public engagement strategy. For the second phase of the initiative, MORPC, along with the Ohio corridor partners for the Columbus-to-Chicago Passenger Rail project (including Union County and the cities of Columbus, Marysville, and Lima), is issuing a Request for Proposals (RFP) to conduct initial components of a Tier I EIS study to advance intercity, rapid-speed transportation service between Chicago, Columbus and Pittsburgh. The study complements and incorporates work for the corridor portion between Chicago, Fort Wayne and Lima currently underway by the Indiana corridor partners that includes the city of Fort Wayne in collaboration with the Northeast Indiana Passenger Rail Association. The Columbus to Chicago Passenger Rail project began as an effort to study passenger rail and identify investment needs to improve freight flows and freight rail congestion between Chicago and Columbus. The project has since evolved to include Pittsburgh in the corridor and expand the scope of study to include other high-speed transportation options that are available, such as Hyperloop. These initial components of the Tier I EIS study are estimated to take 12 months, and the study will collect data, document existing conditions, prepare a purpose and need statement, provide route alternatives and service alternatives for proposed routes, and evaluate infrastructure investments. This study will inform the approach for completing the remaining portions of a Tier 1 EIS. Our RFPs are available here. Hyperloop One is the only company in the world that has built a fully operational Hyperloop system — complete with a levitation system, propulsion, power and electronics systems, controls, vacuum structures, and an autonomous pod. Our team has the world’s leading experts in engineering, technology, and transport project delivery, working in tandem with global partners and investors to make Hyperloop a reality, now. For more information, visit www.hyperloop-one.com.